Being Human - A new direction for communications? BEING VERY HUMAN: WHAT'S IN IT FOR ME? At Virgo we have a new mantra: ‘Being Human’. This paper explains why we’ve decided to centre all our work around it. Like us, you’re only human. And if you’re going to give up a little time and attention to this, of course you want to know what’s in it for you. We’ve thought about it long and hard and we want to share our current views with you.Because this is really important for your business and for your future success as well as ours. Pharma and healthcare organisations are getting more humanly individual in research and development. Personalised medicine takes account of people’s genetic make-up and profile to pinpoint the most effective drugs and treatments. Now it’s time to embrace the same thinking in communication. Why? It’s about the way the people we need to reach live and experience every day.Being Human is a very different outlook compared to traditional marketing, advertising and PR tactics. It’s changing the way we work and it’s changing the way our clients and their brands are perceived. For the better. This approach helps us all see how customers naturally behave and make choices. Organisations in our industry – and beyond – have worked with misplaced assumptions about this. We want to dispel the myths and get to the truth of how communication and decision-making work for real people. We’ve so much to say about Being Human, but this is the place to start. Take 10 minutes to understand the basic principles in this overview. Consider what it means for your business, the way you work, and what you say and do about your brand and product.Then you’ll understand what we mean by being real, being relevant… Being Human.And you can decide if you’re going to act on it. And if you like what you hear, then look at our next paper examining the healthcare impact of Being Human, ‘Humans with a Healthy Interest’. This is a selfie-centric era. Fast-changing technology and innovation are in everyone’s hands via their mobile, tablet, entertainment and leisure tech as well as at work. ‘Do I want it?’ and ‘Do I need it’ rule our decision-making – because if we do, the chances are that we can have it, right away. And if we don’t want it, we can press delete and move on. Human beings want and need to connect with others on many different levels. Not just with people we know and love, but through conversations and interactions with people, groups and organisations all over the world who share our interests or know our acquaintances. Technology means we can make these connections on a vast scale. And they’re as real,authentic and influential as chatting over a coffee with a trusted friend, even though they’re conducted online with relative strangers. People expect and have big and powerful networks of connections. They’re direct and dynamic, genuine and real. They underpin our daily lives and are customised and meaningful to each of us on our own terms. "The real danger is not that computers will begin to think like men, but that men will begin to think like computers." Vast numbers of people are interconnected and technologically proficient. It’s transformed how we find out about and get close to brands. We learn, adapt and evolve fast. We see more, know more and understand more, so we’re more cynical and savvy.Businesses that view us as individuals and react to us in a more transparent, personal way are in tune with our thinking. Faceless companies that talk at us without receiving and engaging feel alien. People communicate in language and gestures, on paper and using technology platforms and devices. They do it at the moment they need to be in touch. Instinctively, they find the style that works for them in the current situation. And they personalise the tone – with a joke, a simile, a picture or emoji, an example or an anecdote. And in real life, people tend to communicate things that the other person – or group of people – is genuinely interested in or needs to know. They talk about problems and how to fix them. They look for reassurance, help and encouragement as well as instruction and entertainment. To get personal, brands and companies need to do it too. They have to make it easy for people to connect with them. And that means talking about the hard stuff too,acknowledging mistakes and how to fix them, sharing the story as it develops. New channels and choices haven’t changed one thing. People can still say one thing,but mean another. Perhaps even more so online and indirectly. So we need to look hard at what’s behind it all. Why do people say and do what they do? With billions of comments and conversations on record, we need insight more than ever, to judge what it all means and form views with confidence. "A man always has two reasons for doing anything: a good reason and the real reason." Leaders and communicators who understand this are opening up to show us their real, genuine selves. They listen, they learn, they understand, they converse rather than preach and sometimes even say they’re sorry. And we love them more for it. They embrace conversation, collaboration, and simplicity.They are defined by listening as much as speaking, in eye-level conversations with customers. Faceless, corporate… it’s over. People’s search for brands they can believe in, brands they can trust, means businesses have to show how they’re Being Human. Whatever past policy has been, we need to open our eyes to what’s relevant to today’s adults, because switched off customers mean business decline. So: how to create these connections with all your stakeholders? Not with ads and pushing messages out, one-way. Try two-way interactions where there’s something init for them and for you. The interaction, that experience itself, is the message. Making listening a priority results in a big change. You use data to organise what you are and offer around individuals’ needs, rather than the other way around. Being Human means telling an authentic story in a relevant way. Keeping it real, as the saying goes. Because reality isn’talways gilded and inspirational. People don’t relate to an over-purified story – it doesn’t reflect their experience. Make it collaborative and inclusive. Keep your core values and customer commitments at the heart of it, always. When you do this, you gain true insight and really engage with your customers. You have your finger on the pulse.You’re open to social influence. 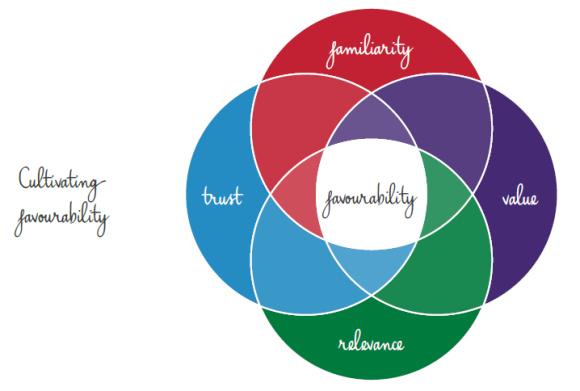 You’re keeping up with a changing world.Those real connections become a foundation for trust.Combine trust with familiarity, relevance and value and you get what every business wants, favourability. Ultimately,people choose a brand by favouring it over others. So now we’ve scratched the surface of the debate.We believe that Being Human is the way forward for our communication, and yours.It’s time to change the question. It’s not ‘how is this relevant to our brand?’ any more.Now it’s ‘how is this relevant to our customers?’ We intend to keep asking the question,because we all need to know every day what keeps our brands and products relevant. What do you think? What could it mean for you? How can we make it work for your business, your brand, your products? Are you thinking what we’re thinking… or something different? This is the start of a conversation, an exciting and evolving one. It will thrive on challenge and new perspectives. We’re here to listen, to share and to keep it real and relevant toyou. Starting as we mean to go on. So join the Being Human conversation: talk to us,email us, argue with us, enter into it at www.twitter.com/virgohealth and www.virgohealth.com. Being Human online is a paradox, but it is real, and it is a real opportunity. This whitepaper from Virgo Health discusses the how's and why's. Whitepaper by Virgo Health on how Being Human can help when communicating in the healthcare setting.